Ever worn a scapular? You may think "How can I commit to wearing something around my neck for the rest of my life?" 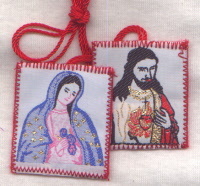 Try one and soon you cannot imagine NOT wearing a scapular for the rest of your life. It is as natural as wearing a shirt, or a watch, or a wedding ring. It is an easy thing to accustom to and a rich source of graces from God. Wearing a scapular is a constant, silent prayer.